Fall Art Exhibition - Don’t Miss It: November 16 to 18! 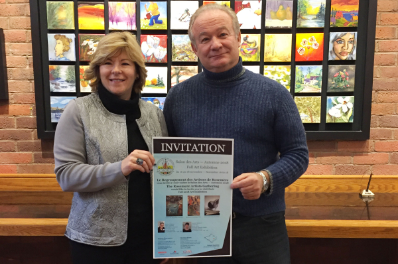 ROSEMÈRE, November 12, 2018– The Town of Rosemère has announced a $1,000 contribution for the Rosemère Artists Gathering’s Fall Art Exhibition coming to Hamilton House November 16 to 18. Some 40 artists belonging to the organization will be on hand to publicly show their most recent works created using the materials and techniques that inspire them, including water colours, oils, pottery and sculpture. This year’s Fall Art Exhibition will be adopting a new approach, which allows visitors and participating artists to enjoy a water-colour demonstration by Sandra Grégoire on Saturday, November 17, from 1 p.m. to 4 p.m., and a talk by Mélanie Matthews on mixed media on Sunday, November 18, from 1 p.m. to 3 p.m. The public is invited to drop by Hamilton House (106 Grande-Côte Road) for the vernissage on Friday, November 16 ( 7 p.m. to 9 p.m.) or at any time between 10 a.m. and 4 p.m. during the weekend.